Private 67039 1st Bn. Sherwood Foresters (Notts and Derby) Regt. Memorial Ref. : Pier and Face 10.C 10.D 11.A. Francis Harold Marshall was born at Selston, Nottinghamshire, on 15th February 1895 and was christened on the 2nd June in the same year at St Helen’s, Selston, Nottinghamshire. He was the youngest son of John Henry and Sarah Ann Marshall (nee Newton) of Kirkby-in-Ashfield) and who later lived at “Oakdene”, Laverick Road, Jacksdale. Other children of the marriage were: John George born Stapleford, Notts; Alfred Lewis born Selston; Florence Mary born Selston; and Gertrude Maud also born at Selston. His father, John Henry, better known as ‘Henry’ was an engine driver. In 1901 the family was living at Dove Green, Selston. Francis was employed by Thomas Mycroft, Butchers of Lower Somercotes, Derbyshire and, prior to this, occupied a similar position with a Mr Saint of Jacksdale, Nottinghamshire. He joined the forces on 23rd May 1916 at Alfreton, Derbyshire. 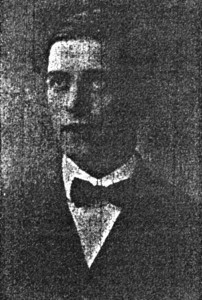 An Obituary in the Eastwood & Kimberley Advertiser dated Friday 18th May 1917 reports that since the end of October 1916, he was in the thick of the fighting. The Sherwood Forester Roll states that he did not join the Battalion until the 24th November 1916, when he joined C Company of the 1st Bn Sherwood Foresters. 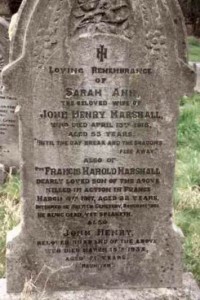 On Sunday 4th March 1917, aged 22 years, Private Marshall was killed instantaneously by shellfire, during an advance on the enemy trenches, near Andover(? ), France. Francis Harold was awarded the British War and Victory Medals. Private Fred George Marshall, 92788, 3rd Bn, Sherwood Foresters is also listed on the Jacksdale War Memorial as having served. From the 1918 Absent Voters Roll we have been able to ascertain that Fred George Marshall lived in Sedgwick Street, Jacksdale. We would be very interested to know if Francis Harold and Fred George Marshall are related. 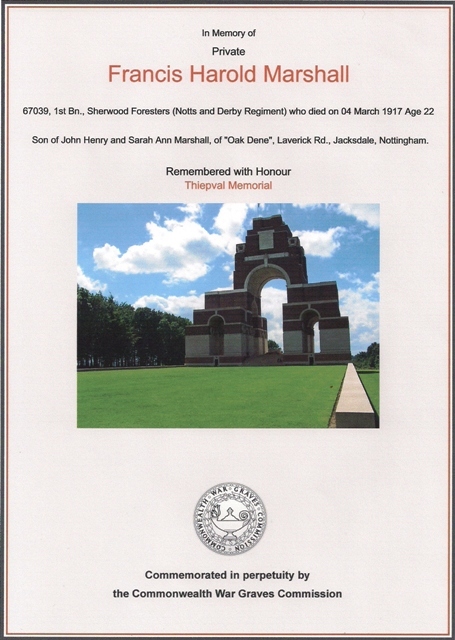 Private Ralph Marshall, 7633885, Ordnance Corps who died during WW2 as a prisoner of war on the Siam/Burma Railway was the son of John George Marshall and therefore is likely to have been Francis Harold Marshall’s nephew.